Globe valves are named for their spherical body shape with the two halves of the body being separated by an internal baffle. This has an opening that forms a seat onto which a movable plug can be screwed in to close (or shut) the valve. The plug is also called a disc or disk. 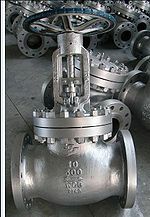 In globe valves, the plug is connected to a stem which is operated by screw action using a handwheel in manual valves. Typically, automated globe valves use smooth stems rather than threaded and are opened and closed by an actuator assembly. Although globe valves in the past had the spherical bodies which gave them their name, many modern globe valves do not have much of a spherical shape. However, the term globe valve is still often used for valves that have such an internal mechanism. In plumbing, valves with such a mechanism are also often called stop valves since they don't have the spherical housing, but the term stop valve may refer to valves which are used to stop flow even when they have other mechanisms or designs. Globe valves are typically two-port valves, although three port valves are also produced mostly in straight-flow configuration. Ports are openings in the body for fluid flowing in or out. The two ports may be oriented straight across from each other or anywhere on the body, or oriented at an angle (such as a 90°). Globe valves with ports at such an angle are called angle globe valves. Globe valves are mainly used for corrosive or high viscous fluids which solidify at room temperature. This is because straight valves are designed so that the outlet pipe is in line with the inlet pipe and the fluid has a good chance of staying there in the case of horizontal piping. In the case of angle valves, the outlet pipe is directed towards the bottom. This allows the fluid to drain off. In turn, this prevents clogging and/or corrosion of the valve components over a period of time. A globe valve can also have a body in the shape of a "Y". This will allow the construction of the valve to be straight at the bottom as opposed to the conventional pot type construction (to arrange bottom seat) in case of other valves. This will again allow the fluid to pass through without difficulty and minimizes fluid clogging/corrosion in the long term. The bonnet provides a leakproof closure for the valve body. The threaded section of the stem goes through a hole with matching threads in the bonnet. Globe valves may have a screw-in, union, or bolted bonnet. Screw-in bonnet is the simplest bonnet, offering a durable, pressure-tight seal. Union bonnet is suitable for applications requiring frequent inspection or cleaning. It also gives the body added strength. A bonnet attached with bolts is used for larger or higher pressure applications. The bonnet also contains the packing, a wearable material that maintains the seal between the bonnet and the stem during valve. The seat ring provides a stable, uniform and replaceable shut off surface. Seat are usually screwed in or torqued . This pushes the cage down on the lip of the seat and holds it firmly to the body of the valve. Seat may also be threaded and screwed into a thread cut in the same area of the body. However this method makes removal of the seat ring during maintenance difficult if not impossible. Seat rings are also typically beveled at the seating surface to allow for some guiding during the final stages of closing the valve. ^ a b http://www.answers.com/topic/globe-valve under heading "McGraw-Hill Professional – Architecture" diagram shows disc. See diagram of "straight body" globe valve with bolted bonnet here. ^ http://www.tpub.com/content/doe/h1018v2/css/h1018v2_37.htm Globe Valve Disks. See diagram of angle globe valve here. Control Valve Handbook – Fisher Controls International (4th Edition) – a complete 297-page online book. Process Instrumentation (Lecture 8): Control valves – an article from a University of South Australia website.